With the upcoming Q4 release of SAP Jam we now offer these customers a lot more flexibility to customize the header to either change it slightly, add icons to pages or apps they want to have available to every employee from wherever they are in the intranet, or even to completely replace it with an html-based header that aligns with the layout of their already existing intranet solutions. In this blog I’ll introduce this concept with two examples. SAP offers a wide variety of business applications to its customers, from CRM solutions like SAP Hybris Marketing or SAP Hybris Cloud for Customer, to HR solutions from SuccessFactors, to ERP solutions like S/4HANA. All these apps can be accessed and launched by employees from the Fiori Launchpad. The Fiori Launchpad then displays the apps, personalized for every user based on his role and authorizations. 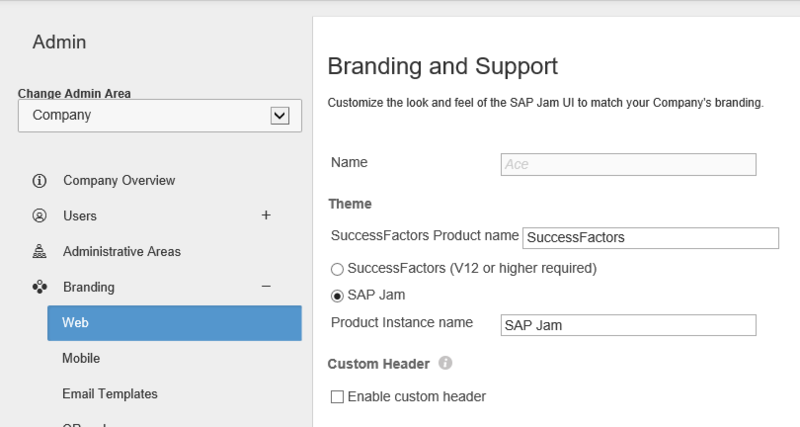 Customers who are using SAP Jam as their intranet and any other SAP business application might want to provide a prominent link to the respective Fiori Launchpad. In a similar way customers might want to provide a link to something like a phone book. 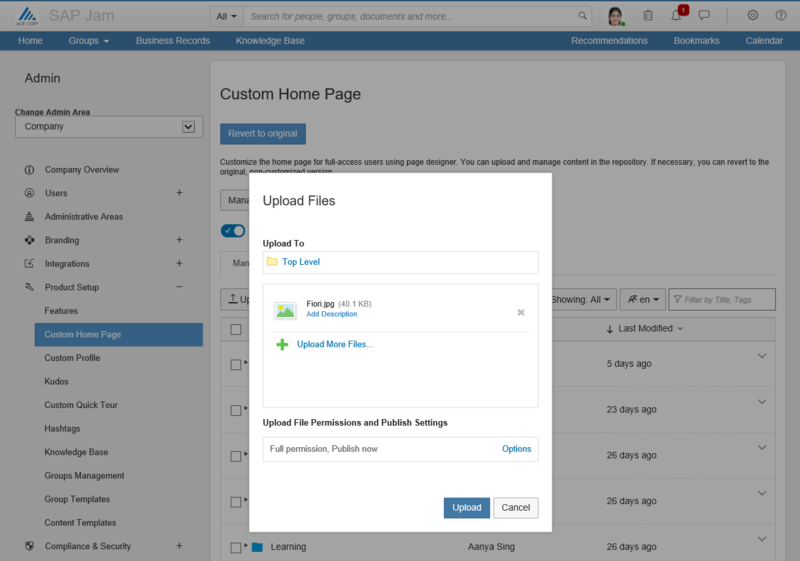 In our example we will just use the employee search page of SAP Jam and also highlight that at the top of the intranet page. 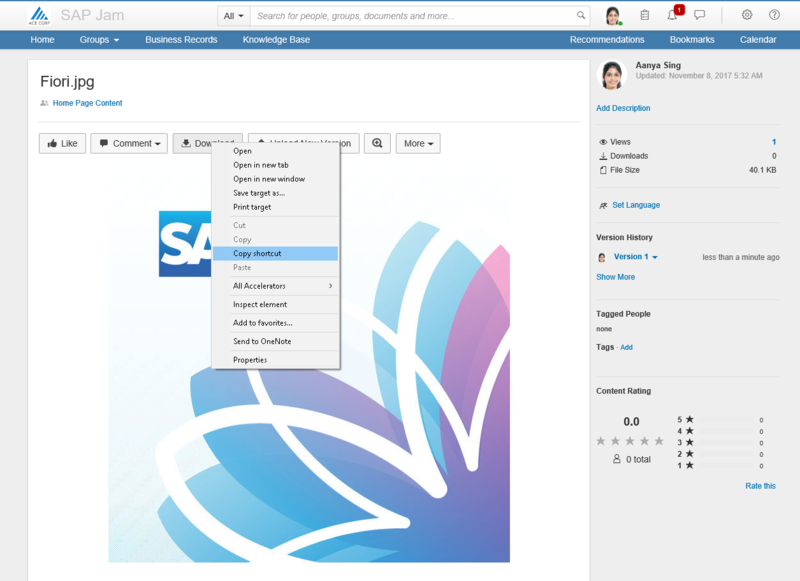 Here’s the final result we want to achieve: Two additional icon-buttons in the top left corner, one that launches the Fiori Launchpad, the other one that opens the employee search in SAP Jam. First thing we need to, are the two icons. You can host these icons on any webserver to get a publicly accessible URL for them. The easier way in my opinion though is to just upload them into a public group or into the home page content section in Jam directly. Once you uploaded them, navigate to it in Jam and do a right click on the Download button and copy a shortcut to the picture directly. Now that you have the URLs of the pictures you can include them into your header. Once you enabled the custom header option you will see html code for the standard delivery of SAP Jam. You can now easily remove certain icons if needed, or you edit the html to exactly how you want it. Let us know your feedback and what you come up with in your customized header.